Booze remains by far the most damaging drug in the Central Australian outback: the top police officer in the bush says alcohol is doing 95% of the damage, with ganja (marijuana) the most popular illicit drug, and amphetamines playing a very minor role. Police Superintendent Peter Gordon’s beat is called Central Desert, with Alice Springs in the middle, around 600,000 square kilometers, twice the size of Germany. He has 52 officers in 17 remote police stations. The trauma caused by alcohol is always on top of their agenda. Most is illegally taken to the communities – the majority of them declared dry – by locals who buy it in the regional centres for themselves and their friends. Not much of it comes from commercial-style sly grogging, but what does fetches astronomical prices, says Supt Gordon: $200 a carton of VB and $150 a bottle of Jim Beam is not uncommon. There is an absurd aspect to all of this: alcohol is a legal substance but for remote people, wanting to have drink, legally, is quite difficult. They’re not allowed to drink in their home communities. Drinking in public places and in the town camps in Alice Springs is also prohibited. So the options are drinking in an Alice bar – and dress codes may be a problem there – or at the home of “rellies” who may regard such visits as humbugging and disruptive. No wonder trying to smuggle grog into dry communities has become a time-honoured pastime, not without its lighter moments and revealing astonishing resourcefulness. Supt Gordon says one old scheme was running a car out of fuel, decanting the booze into the petrol tank, and towing the vehicle to the community. Vehicles and even aircraft used in grog running can be confiscated. Supt Gordon says during his time in the Top End passengers of a plane were observed getting out of it at the far end of the runway, with contraband alcohol in their possession. The young pilot then taxied to the parking area where police were waiting. Supt Gordon asked the pilot where in the wings the fuel tanks are. Supt Gordon was only half joking: the plane was impounded for some time, the charter company was fined heavily and the pilot lost his job. Complicated transport arrangements are also common for illicit drugs. It’s not uncommon for parcels to be sent from Adelaide to Perth via Alice Springs, Katherine and Broome. Not long ago a substantial quantity of ganja was found on a bus heading north from Alice Springs. Sniffer dogs have an extraordinary ability to find drugs including – on one occasion – some hidden inside a fried chicken, not fooled by the scrumptious odor of the chook. Some dealers hide it in hollow tubing of bull bars or roll bars, or in fake lining of eskies. Drugs usually come from southern states with a lot coming through or from Adelaide , says Supt Gordon. Very few are produced here. There is some local manufacture of amphetamines but the process is too complicated and the ingredients, too hard to get. Ganja, often in substantial quantities, arrives cryovac-packed for distribution to sub-dealers, or already split up in small deal bags. There is practically no heroin – very expensive, says Supt Gordon – and cocaine is regarded as something for the “stockbroker types” in the big cities. Not surprisingly, the illegal activities are more prevalent the closer the communities are to Alice Springs. Places such as Hermannsburg – an hour’s drive – cop a lot. When the traveling time is longer more is consumed en route. Nevertheless, it’s not unusual for people to drive vast distances to get booze. In the eastern part of the region it sometimes comes from Queensland where the popular four liter wine casks – barred in the NT – are available. Big volumes can be bought in Mt Isa supermarkets without raising suspicion, and without the identification requirements in the NT. 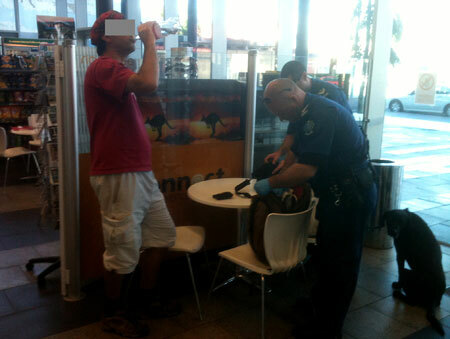 Photo: Top – Backpacker’s luggage being searched by police using a sniffer dog in the Adelaide bus terminal, a suspected place from where drugs are imported to the Northern Territory. 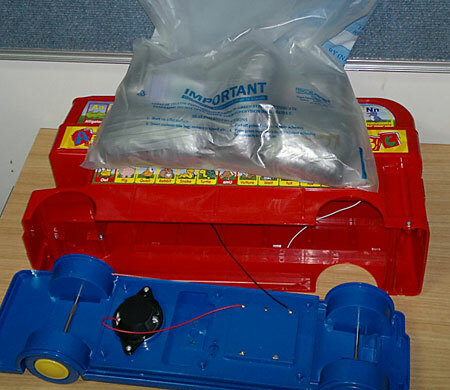 At left – Marijuana concealed in a child’s toy for transport yesterday to a Top End remote community.